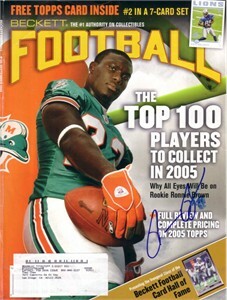 Sept. 2005 Beckett Football magazine COVER ONLY autographed in blue marker by former Miami Dolphins star running back Ronnie Brown (slightly smeared). ONLY ONE AVAILABLE FOR SALE. With certificate of authenticity from AutographsForSale.com.